I did it again – that makes 5 successful Ludum Dare entries (including one Mini LD). And one year on from making a clunky game with RPG leanings in a fantasy setting, I have made another clunky game with RPG leanings in a fantasy setting! The theme this time around was “Alone” and once again I wasn’t immediately struck with inspiration. 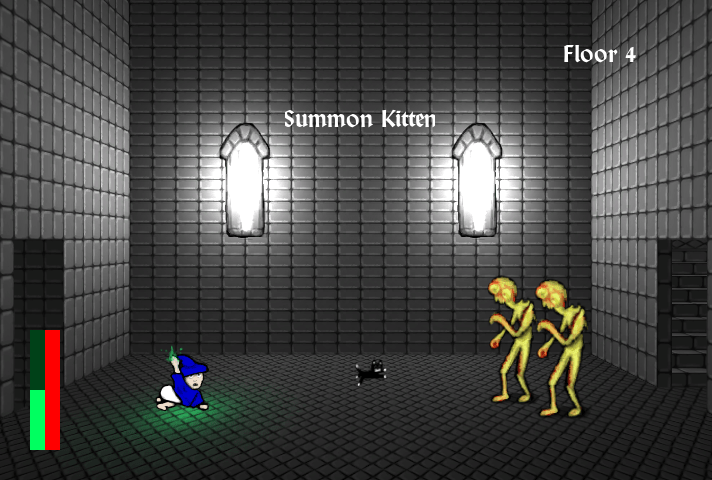 I eventually decided to approach the theme from the “fighting alone against many enemies” angle, arriving at a scenario where the player must guide a baby in a fight alone against numerous monstrosities. I’d already decided to use the competition to go through the motions of making a game with Unity, having always used Flash and Flixel before; and in that regard I’m really pleased with how it went. Unity has taken a lot of getting used to for someone much more used to traditional programming projects but I feel like I may have now made the breakthrough. I’ll definitely be returning to Unity in the near future. Admittedly, the game itself – “Tower of Abominations” – was a mixed success. Possibly due to spending a little more time on art than I could afford, combined with my relative uncertainty with Unity, resulted in me struggling for time. The game needs usability improvements: particularly I realise dumping the player back to the beginning for failing at any of the floors is unnecessarily cruel for a game that requires trial and error to complete. But all-in-all a great experience once again, and one to build on in future I have no doubt! And once again, just like last time, I ran a timelapse of my screen during the whole sordid thing.